The end of our ‘journeys to school’ project. This week the children thought about the surfaces they travel across on the way to school then created textured footprints to convey the feel and look of roads, paths, fields and mud. They then carried on experimenting with animal footprints. I’d intended to work with them creating a huge map of their journeys to school using all the artwork we’d created in this project. In reality, there was so much to explore with the travel textures that we ended up exhibiting all the artwork on the classroom floor at the end of the session. I feel that during this project the children have closely observed and thought about their journeys sometimes using them as a start of a fantastical narrative. At the end of this session the children invited their parents to view their art and talked them through their personal view of the daily school run. Wetheringsett School invited us to work with the whole school as part of their eco week. They were keen to create a shared large piece of art to be exhibited in the school. Before the project we agreed that the theme would be about an imaginary plant that might grow from discarded plastic bottles as they start to decompose. The children collected sacks of plastic bottles and more Christmas sweet wrappers than we’ve ever seen gathered together in one place before, there’s something very beautiful and tactile about them en masse. After an assembly introducing the theme the children took part in three activities. We worked with them exploring ways to transform the plastic materials into component parts of a large plant installation for the library area. The children discovered some ways of transforming the plastic bottles that we hadn’t seen used before. Alongside this we asked the teachers to set up a large scale shared drawing allowing the children to imagine plants that might grow from the plastics. In another activity they put themselves in the position of scientists classifying the newly discovered plant and determining it’s growing needs and habits linking back into growth as a curriculum topic. Art day at Weatheringsett Primary school imagining what would happen if throwaway plastics took root-the plant lab. Our first of four art clubs exploring texture, today we discussed what we meant by texture and how we might use it in our art. To get started we gave each of the children a bag with something hidden inside then asked them to describe what they could feel and try and draw it using different materials and techniques. 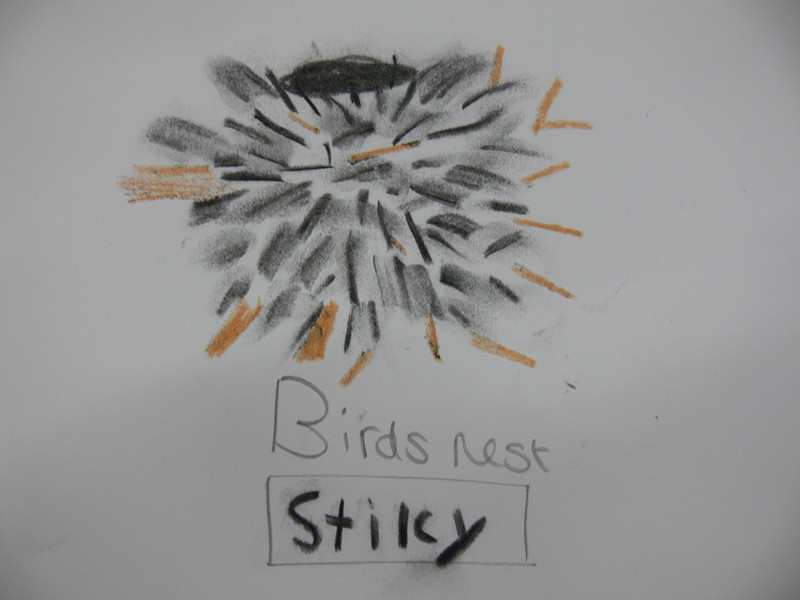 A lot of the children enjoyed using charcoal, covering their page entirely then making marks with a rubber. Next they took turns suggesting words to describe texture and made marks to represent the words. I think scaly and spiky were the favourite ideas to draw. Finally we used rubbings to discover what textures night be found on the surfaces of the school hall. 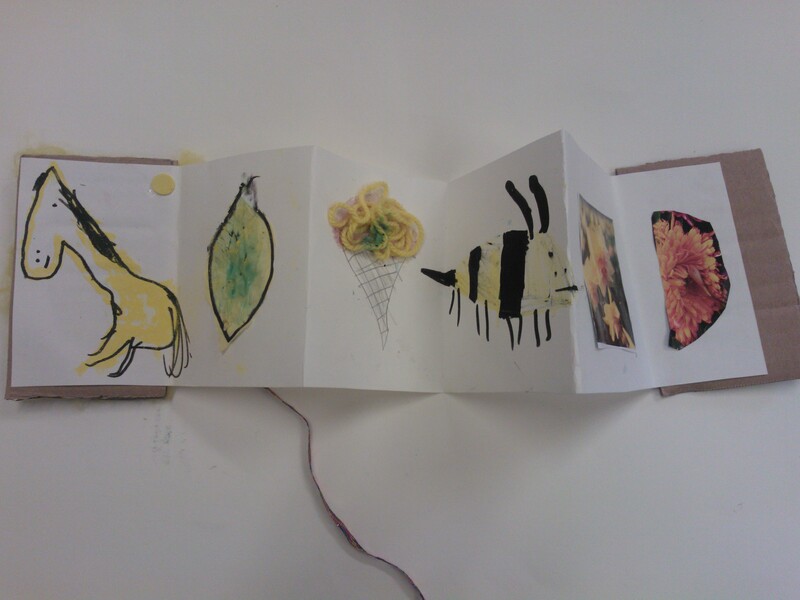 The children selected their favourites to add to their sketchbooks and some of the children extended the activity transforming the rubbings into drawings or abstract designs. Really enjoyable family drop in session this afternoon. Inspired by the Sophie Ricketts photography exhibit the families braved the sudden wintry weather and explored the churchyard with magnifying lens searching out objects that would normally be passed un-noticed. Back in the studio these objects became large artworks sometimes encompassing imagined elements such as fairies that can only be viewed through a lens. For the next four weeks we will be exploring how artists use texture in their artwork. 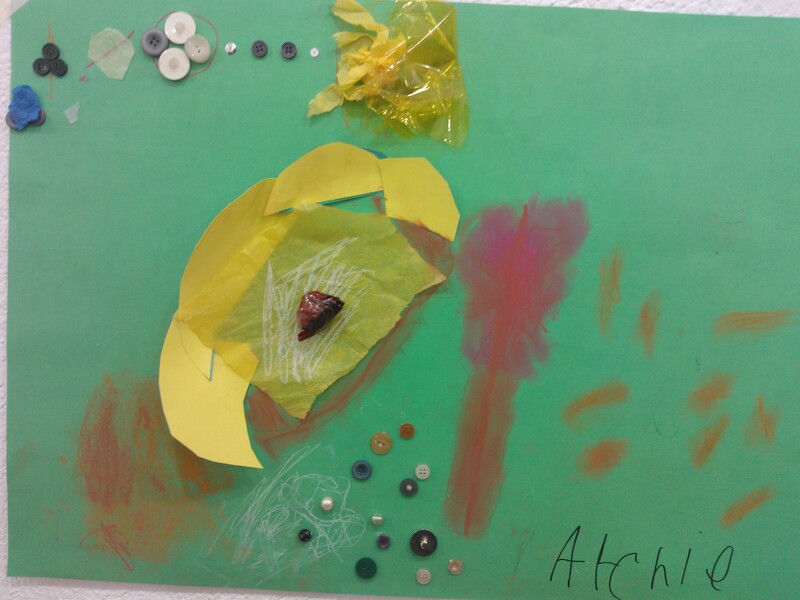 We passed some artwork around the table and tried to describe their texture in words (we liked ‘scratchy’). The children were then given a bag with something hidden inside. Without looking they felt the object and tried to draw, with a variety of media, the surface that they could feel. Next we decided to see how many interesting textures we could find in our immediate environment. We discussed how we could take a rubbing for hard surfaces and would have to draw a softer surface. 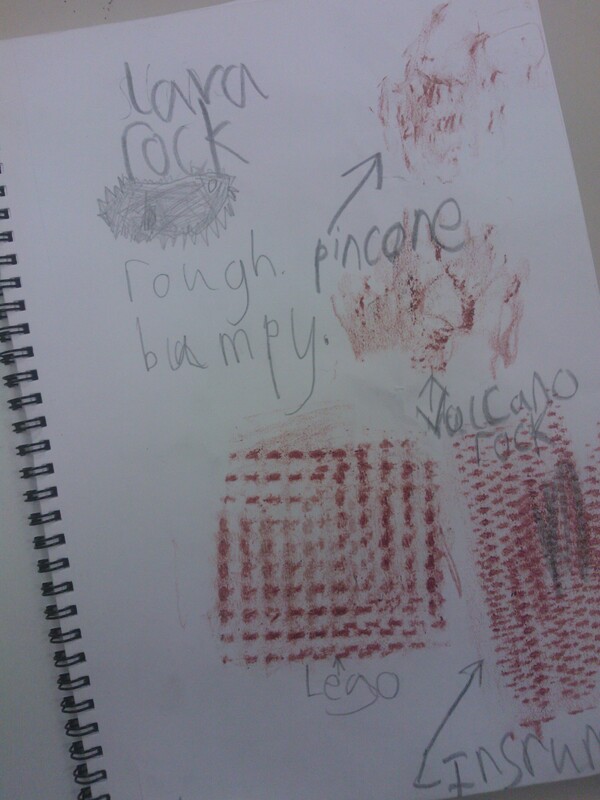 The children collected the textures on different papers and created a texture library in their sketchbook. They then took larger rubbing and created a communal texture map of the classroom. To finish the session we reflected on which surfaces had revealed the most interesting textures and discussed how we might use these in our art next week. Third art club about colour. We chatted about what certain colours make us think about and why we like some colours and not others. 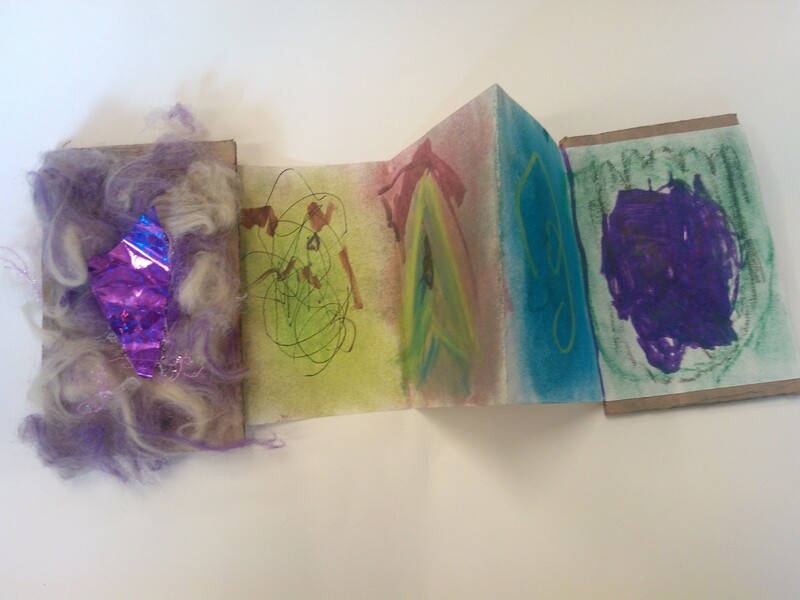 The children then created sketchbooks of their favourite colour using different textures, media and materials. Some people stuck to the one colour theme while others were keen to explore different combinations. We talked about creating your favourite thing in your favourite colour which raised a few eyebrows. I think we’ll be revisiting that theme next week.